This seminar we will review regulatory requirements for a new facility as well as looking at the life cycle of a project from conceptual design (URS -User Requirement Specifications) to PO (Purchase Orders), FRS (Functional Requirement Specifications), FAT (Factory Acceptance Tests) and finally SAT (Site Acceptance Tests). Specific quality requirements will be discussed and the case study of BTG will round off the discussions. 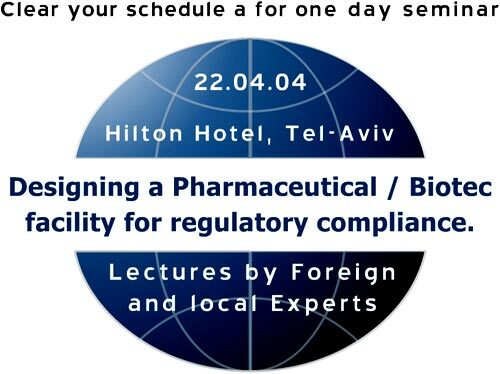 This seminar is intended for industry professionals who are responsible for Engineering or Engineering firms that are involved in building or renovating pharmaceutical and Biotech facilities, Quality Assurance, Regulatory and validation personnel. In addition, contractors, equipment and facility suppliers and others who participate in this process, such as process development and operations personnel at all levels of management will benefit from learning what to expect and how to foresee and prevent problems. Mr. Tribe is a senior GMP Advisor at the Australian Health Authorities and is a key member of PIC/S.